Thanks to the magic of YouTube anyone with a computer, tablet or smartphone and a few minutes to spare can take a look at aviation’s future as imagined in 1967. That future, as portrayed in this NASA publicity film Flight to tomorrow was sleek, supersonic and carefree, with a blithe assumption that commercial aviation would continue to be an ever-faster means of transport for the relative few who could afford it. After all, that had been the trend of the previous 64 years since the Wright Brothers’ first flight. In the opening scenes prediction and nostalgia merge, as well-dressed passengers check in at uncrowded terminals, and are borne aloft in the ear-splitting, smoke-belching style of a Boeing 707. The past is treated with little reverence, as evidenced by an audio howler, in which a pre-world War I monoplane is overdubbed with the unmistakable menacing growl of a Cold War B-36 bomber. Stirring footage of the stunningly fast X-15 experimental rocket aircraft (landing on skids at up to 200 kt!) links to a discussion of the future, which is presumed to be a triumph for the Boeing 2707 supersonic transport. It seemed a reasonable assumption, as the 2707 project was underway, with variable sweep wings and variable geometry engine inlets. 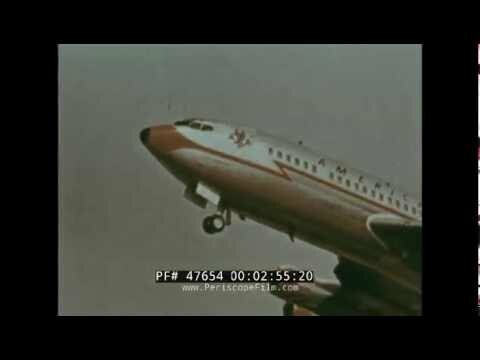 Rare footage shows a cockpit mock-up, complete with a drooping nose for better visibility during approach and landing. The 2707 was projected to carry 350 passengers at a height of 70,000 ft and a cruising speed close to Mach 3 (about 2000 kt, since you asked), faster than Concorde, which was the only supersonic transport aircraft to enter service. “Some problems remain to be solved,’ the narrator cheerfully concedes, over footage of a 2707 in a wind tunnel. More rare imagery, of an XB-70 Valkyrie bomber prototype, accompanies discussion on the technical aspects of supersonic flight. Some questions raised by the film have proved more timeless then the Boeing 2707, which was cancelled in 1971. ‘What is the proper balance between automated systems and the proper use of man’s vision and senses,’ it asks. In the wake of the Air France, Air Asia and Asiana crashes of the 21st century, aviation is still trying to answer that one. The film discusses briefly noise, which was one problem the 2707, with its projected destructive sonic boom was unable to overcome. But optimistically it mentions how NASA scientists are working on hypersonic transports, which will fly at 6500 km/h or about 3500 kt. It predicts these aircraft may be ready within 20 years – by the 1980s. This prediction has proved durable because reports of hypersonic aircraft are still a regular feature of aviation journalism. Fifty years later they remain 20 years out, as does the prospect of commuting to work in a person vertical take-off and landing (VTOL) aircraft. This particular prediction is having a revival thanks to developments in drones, electric aircraft and lithium ion batteries. There’s no mention of an aircraft which was in the early stages of design when the film was released, and went on to dominate commercial aviation around the world. It was, of course, the Boeing 747, which at the time was seen as a stop-gap project. Its distinctive humped flight deck was designed for easy conversion of the design into a freighter, after its presumed replacement by the 2707. At the time the film was made all that was in the future, which as experience has shown, is inherently hard to predict.